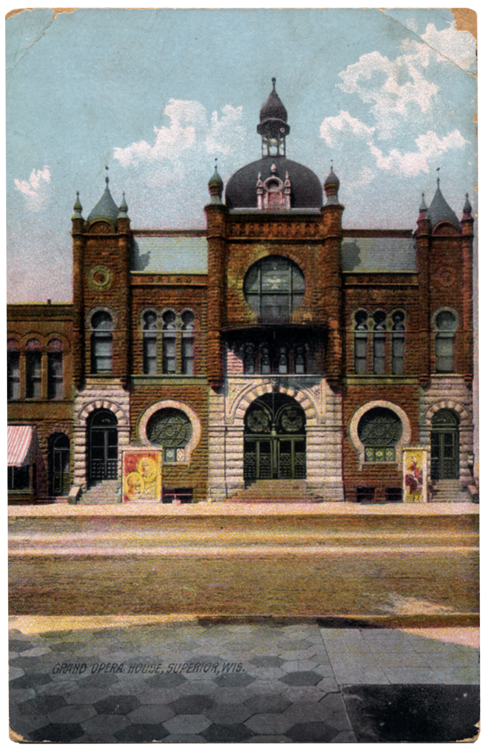 Superior’s Grand Opera House first entertained Superiorites in 1890 after it was built by—yes—the Land and River Development Company, managed by John Hammond. The theatre was made of brownstone and Dreback sandstone and included a dozen private boxes and sat 1,200 audience members. Over the years the Opera House’s patrons enjoyed concerts, plays, operas, boxing and wrestling matches, and later, vaudevillians. The players dressed in rooms in the basement and on the second floor of the building, and the rear of the structure was made high enough for the curtains to actually raise rather than being rolled up. The Opera House recovered from fire damage in 1909 and again in 1911, but couldn’t survive the burning popularity of motion pictures. It closed in 1924. Fire did finally destroy the building in 1939.